OKLAHOMA CITY (July 28, 2015) - Caney students recently took on a space race of gooey proportions through their involvement as a 21st Century Community Learning Centers (21-CCLC) site. Through 21-CCLC, the Caney Independent School District took advantage of a collaboration between the U.S. Department of Education (USDE) and NASA to help students use extracurricular time to learn about science, technology, engineering and math (STEM). Caney was one of eight districts in Oklahoma to participate in the program, and Oklahoma was one of only 10 states in the nation. 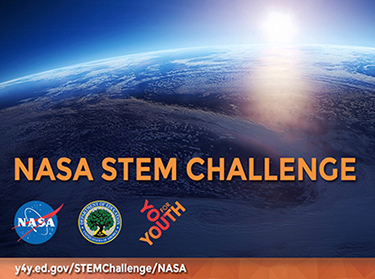 Participating student teams solved real-world engineering design challenges with assistance and mentoring from NASA engineers. The challenges were funded through 21-CCLC, which provides academic enrichment to children and their families when school isn’t in session. As part of the project, Kris Brown’s science students from the southeastern Oklahoma district spent nearly eight weeks designing “marshmallow pressure suits” to simulate protection from the vacuum outside Earth’s atmosphere. Eighteen Caney students in grades 5-8 met for an hour after school, four days a week for eight weeks, to design simulated pressure suits. The goal was to put a marshmallow through a vacuum chamber and retrieve it safely, without it flattening or exploding. Upon completing the experiments, each team of three created a video explaining their designs. In May, one of the teams from Caney presented their project alongside six other teams from across the U.S. in a videoconference with a panel of senior NASA and USDE officials. That team was one of only four schools nationwide to present again on Monday, July 27, in a virtual showcase to officials. “I’m extremely proud of all my students who participated in this challenge. They all worked really hard,” said Brown, who is also Caney’s 5th-8th grade science teacher. He said he saw an opportunity to engage children in learning after school when some of them might otherwise have been sitting at home. Brown oversaw the project with afterschool coordinator Shonda Thomas. Options or exploration in the program included creating a game that can be played in microgravity, building a device that could safely land an object on Mars, constructing a radiation shield that could splash down in the ocean, designing a crew exploration vehicle and developing a chamber for growing plants on the moon. Caney chose the pressure suit challenge in part because it offered an opportunity to work with a vacuum chamber, an unusual tool for a small science classroom. Since there is no requirement to stay after school, it was also important that the challenge offered enough activities not only to be educational, but also fun, Brown said. “Who doesn’t want to put a marshmallow in a chamber and see if it gets bigger or if it shrinks?” he said. As students developed their prototypes and put them through the first rounds of testing, they got some help from the space scientists. NASA engineers answered questions through a live video feed for nearly an hour and a half, Brown said. As they asked their questions, the students were able to see themselves side-by-side on the screen with career scientists and engineers. The scientific process and atmospheric pressure, density and temperature may have been the academic principles his students covered, but the project also provided opportunities to build character through teamwork and competition. “I saw some great leadership skills with the older kids, in a sense, mentoring the younger kids,” Brown said. It was rewarding, Brown said, seeing a group of students get so excited about an engineering project that they stayed after school to keep learning.